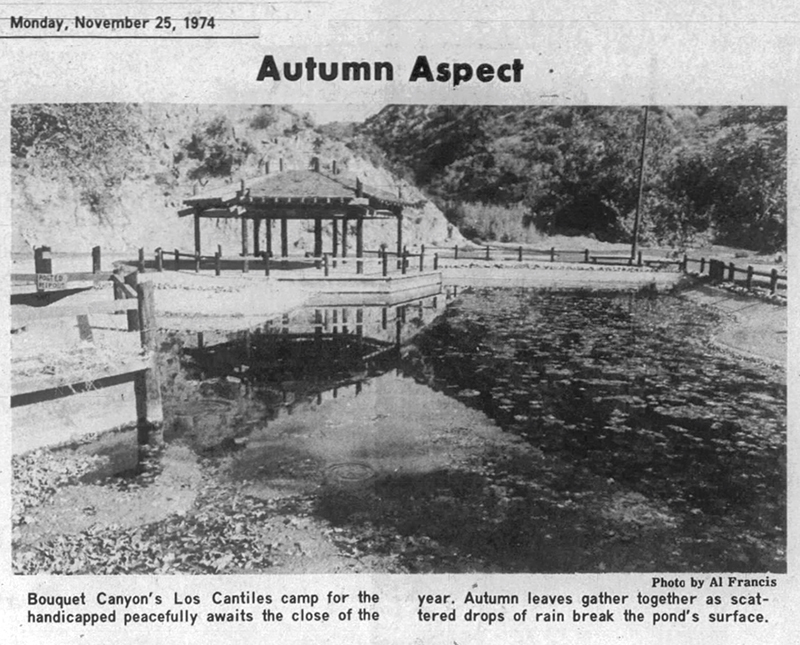 SCVHistory.com LW3342 | Organizations | Newhall-Saugus Lions Club: Los Cantiles Park, Cloissone Pin, 1970s. 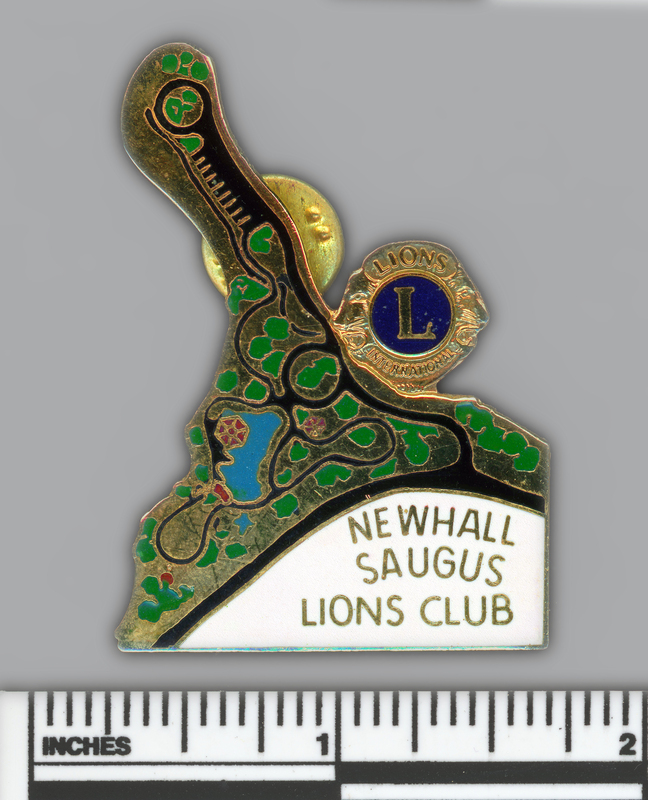 Newhall-Saugus Lions Club: Cloissone pin, approx. 1.5x2 inches, showing an aerial view of Los Cantiles park in Bouquet Canyon, 1970s. East is at the top. Construction began January 30, 1972, on a new park in Bouquet Canyon designed especially for handicapped persons wishing to recreate in the Angeles National Forest. 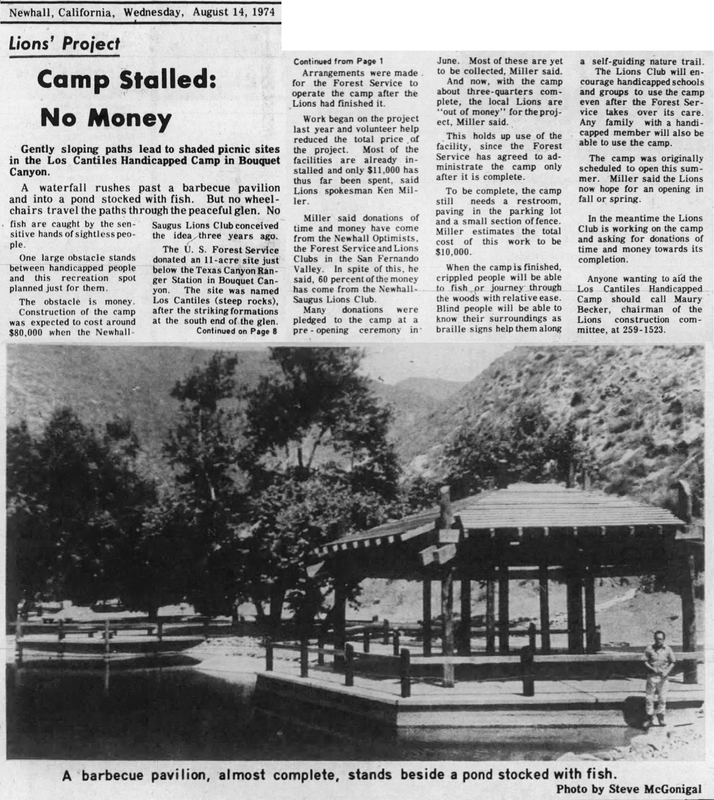 Conceived and spearheaded by the Newhall-Saugus Lions Club in league with the U.S. Forest Service, Los Cantiles Handicapped Picnic Site, as it was initially known, was (and is) located at a bend in Bouquet Canyon Road just north of the "sharp rocks" for which it was named. At the time, it was situated between the rocks and the Texas Canyon Ranger Station on the north; the old ranger station has since been abandoned and replaced by a new ranger station just south of the rocks. So, going up the canyon today (2018), it's ranger station, then rocks, then Los Cantiles. In the 1970s, meeting the needs of handicapped park patrons wasn't de rigueur. The Americans with Disabilities Act didn't come along until 1990. Today all new parks trails are designed for wheelchair access, but they weren't in 1972. Back then, meeting special needs required money, political will and community-minded people such as Lions Club members — and the Optimists helped, too. Los Cantiles would include not only wheelchair-accessible trails but also appropriate tables and seating, shade coverings, signs in Braille along the trail and a pond for fishing (but not in drought years). 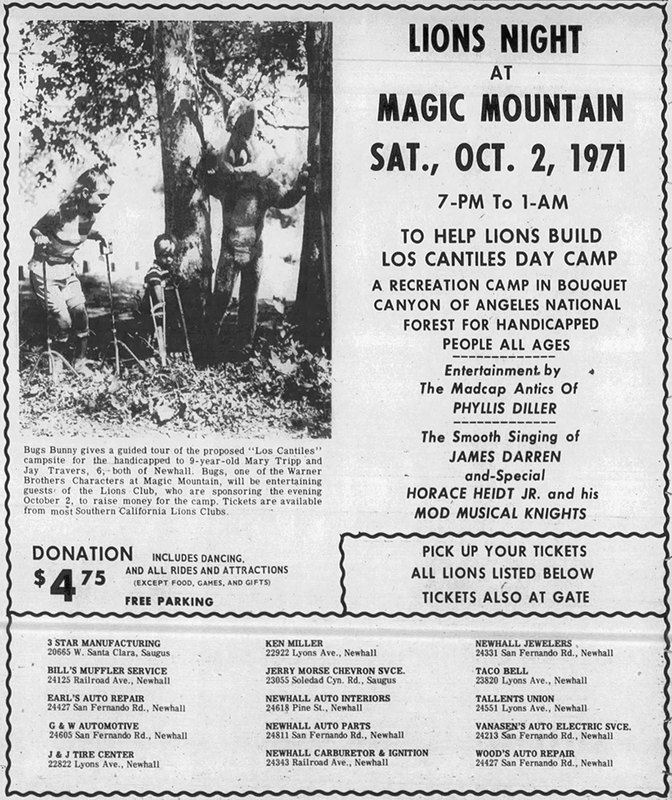 Fundraising turned into a multi-year process and took on several forms including an initial benefit in 1971 at the new Magic Mountain amusement park with performances by comedienne Phyllis Diller and bandleader Horace Heidt (father-in-law of future Santa Clarita Mayor Jan Heidt). This unique day-use area offers a picnic site which not only provides restrooms, water and tables, but is also equipped to accommodate visitors with disabilities. A multilingual/Braille-signed nature trail, suitable for wheelchairs, circles the small man-made lake (no swimming allowed, however). Maximum capacity is 200 persons. Fees apply for large groups and for wedding parties of any size. Google image 2018. Click to enlarge. The Signal | Monday, January 31, 1972. 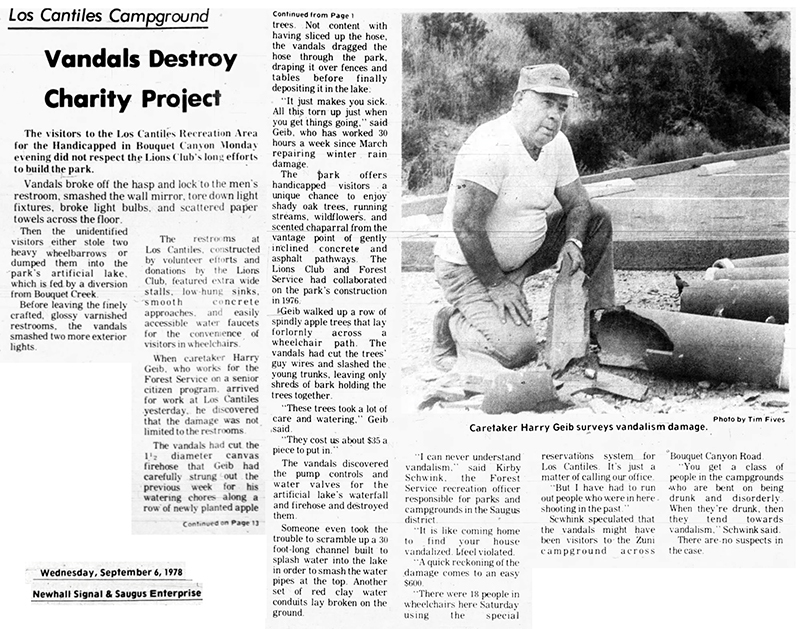 A shovel yesterday broke through Angeles National Forest sod that some will never see or walk upon. They are the blind and handicapped for whom campgrounds are not traditionally constructed. But that shovelful of dirt signifies a new concept in forest recreation. Eventually, the blind and handicapped will have a facility specially suited to their needs where groundbreaking ceremonies were held. 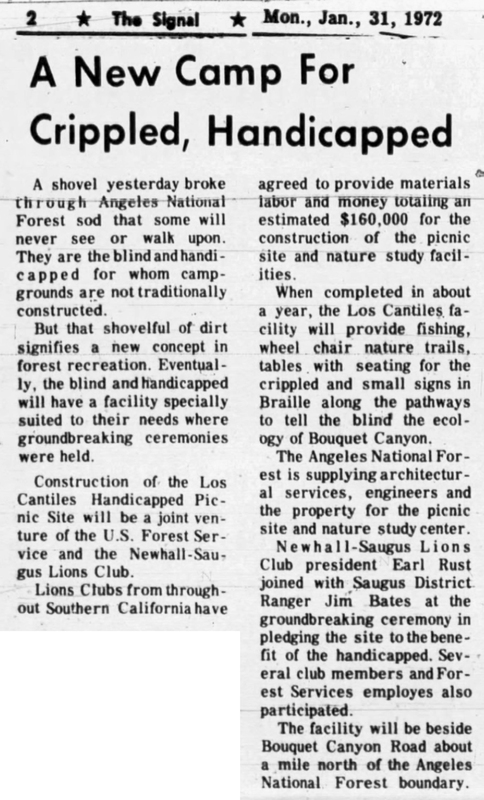 Construction of the Los Cantiles Handicapped Picnic Site will be a joint venture of the U.S. Forest Service and the Newhall-Saugus Lions Club. Lions Clubs from throughout Southern California have agreed to provide materials, labor and money totaling an estimated $160,000 for the construction of the picnic site and nature study facilities. When completed in about a year, the Los Cantiles facility will provide fishing, wheel chair nature trails, tables with seating for the crippled and small signs in Braille along the pathways to tell the blind the ecology of Bouquet Canyon. The Angeles National Forest is supplying architectural services, engineers and the property for the picnic site and nature study center. Newhall-Saugus Lions Club president Earl Rust joined with Saugus District Ranger Jim Bates at the groundbreaking ceremony in pledging the site to the benefit of the handicapped. Several club members and Forest Services employees also participated. The facility will be beside Bouquet Canyon Road about a mile north of the Angeles National Forest boundary. LW3342: 9600 dpi jpeg from original pin purchased 2018 by Leon Worden.